One millimetre of rain on one square metre of roof yields one litre of water. In one wet season, this is a vast amount of water from an entirely natural and free resource! 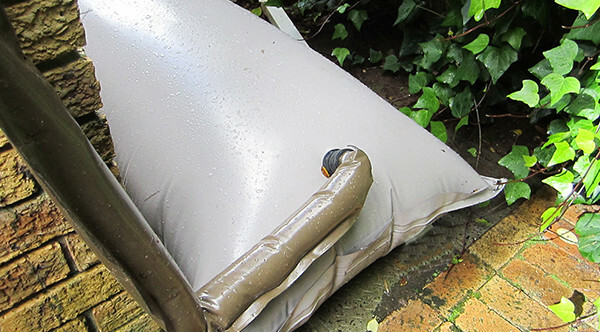 The Rainwater Harvester is simple to install and is supplied with clear instructions on how to assemble and attach the bag. 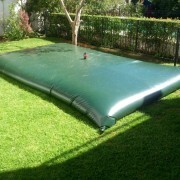 The DIY fitment makes this an affordable solution without any installation charges or specialist skills required. The collection of this free water allows the pool, garden and home to become water-neutral, which means zero reliance on city water. 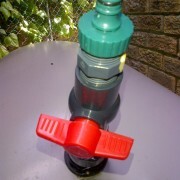 An affordable way to collect non-potable water for use in the garden or for topping up a pool. An excellent approach to long-term water storage for use in times of water scarcity and water restrictions. Because the Harvester stores water in a completely sealed environment, sunlight cannot penetrate and algae growth is avoided, thereby improving the water hygiene without any chemical treatments. Easy to dismantle and store when not in use. The Harvester is also easy to move when empty to another area/downpipe. Can be custom made to any shape or size to suit a specific area in the garden, including under patio decking for a more discrete storage solution. Materials and specifications. 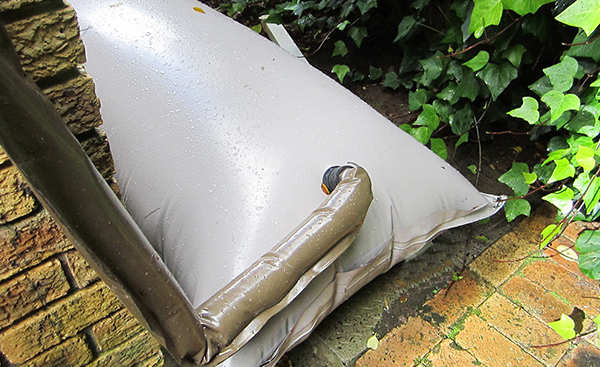 The Rainwater Harvester is made from a 600gsm PVC material that has been UV treated to allow for a lifespan of at least 5 years with no degradation of the material. The outflow contains a ball valve and standard 25mm click-on garden hose connector for connecting to an existing hosepipe. Supplied in DIY kit form with all the fittings for the inflow and outflow already attached. A protective layer of Sealmac polyester geotextile is supplied, which is laid on the ground and on which the Harvester is placed. This reduces the likelihood of potential damage to the Harvester by any sharp objects on the ground. A gutter guard is supplied which is placed into the top of the downpipe to prevent any leaves that may be in the gutters from clogging up the water flow into the Harvester. 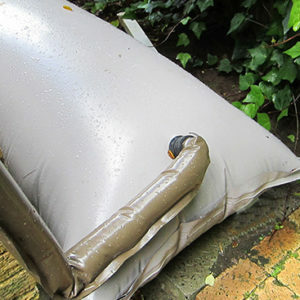 The Power Plastics Rainwater Harvester has a pillow shape and lies on the ground next to a gutter downpipe. To install, the downpipe is cut one metre from the ground and the Harvester is connected to the downpipe via a header tank, hose and clamps which are supplied. 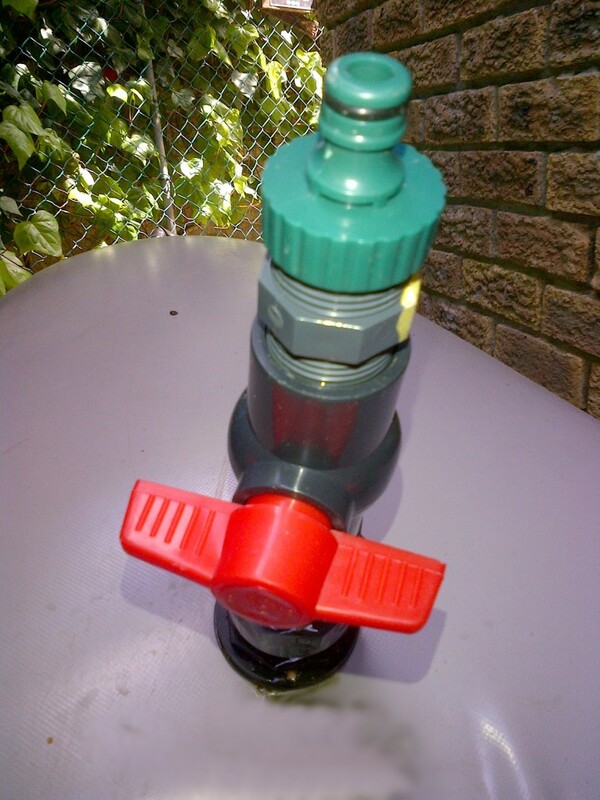 The water is released under gravity feed via a normal garden hose connector. We recommend installing the Harvester on a slight incline so that the outflow is below the inflow to create added the pressure for the outflow. To increase the volume of water that can be stored at any one time, additional Harvesters can be interconnected in series. 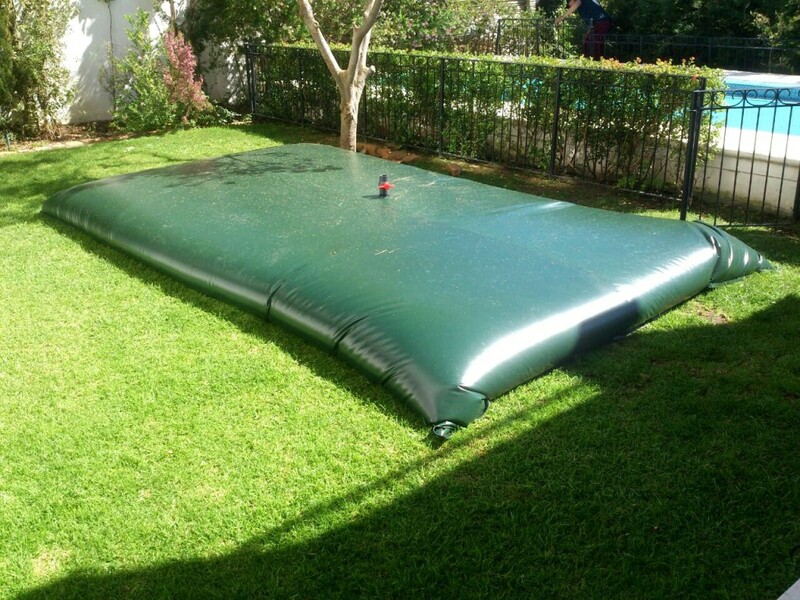 The Rainwater Harvester is available in a number of sizes to suit your water requirements and space constraints. The Harvester can also be custom-made to suit individual requirements. The Harvester has a 1 (one) year warranty. Always follow the installation, maintenance and user guidelines to avoid the warranty being voided.